"The weak have forgotten who we are. We were exiles, yes—but heirs, also. Heirs to Llovar, the greatest of us all. Now the Westmen, the Dhawc, and the Ylairc shall know the bite of Llovar’s locusts once more!" Long ago, the world met darkness. Beneath red banners, horror gripped the land. Wandering, thirsty, and bloodied by rage, they swarmed the land like locust: mindless, hungry, and darkened by magic. They swallowed the land like pigs. Beneath red skies, cursed and terrible, the horrors of unseen, unheard, and undreamt were born. But that evil died out ages ago… didn’t it? As the battle for Terrinoth continues, a fourth faction joins the fray with the Uthuk Y’llan Army Expansion! 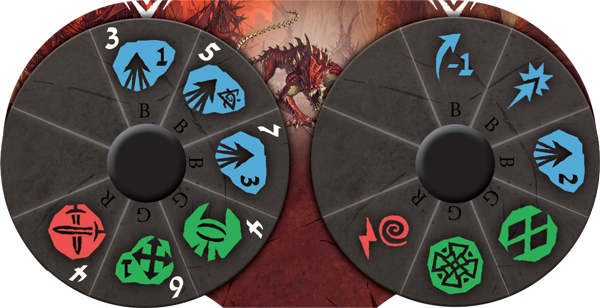 The demons of generations past have returned with this massive expansion that includes twenty-two miniatures for you to build your demonic army. Under the command of Ravos the Everhungry, who we examined in a previous preview, the Uthuk Y’llan Army Expansion offers sixteen Berserkers, four Flesh Rippers, and one Spined Thresher. Additionally, this expansion includes twelve upgrade cards to strengthen your Ynfernael forces and equip them to spill rivers of blood in your name. 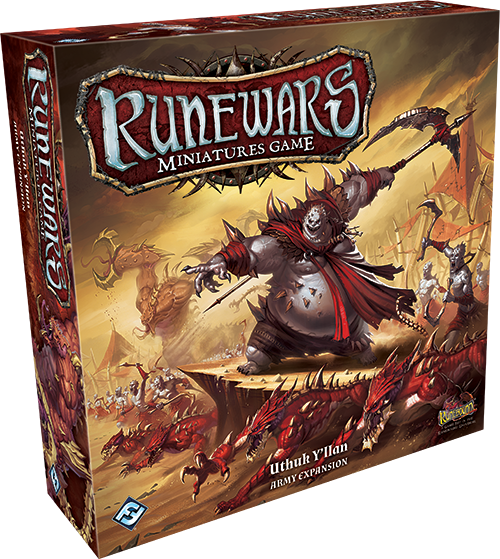 Today, Fantasy Flight Games is pleased to offer a closer look at the demons that fill the ranks of the Uthuk Y’llan army in Runewars Miniatures Game! Surrendering to the darkness of the Ynfernael corrupts everyone, twisting the souls and bodies of those who would use its power. Unnatural growths erupt from beneath the skin and madness burns cruelty and bloodlust into the minds of those touched by its dark power. Thus is the fate of the Uthuk Y’llan. Many of these once-proud people of the steppes have become the shrieking Berserkers of the Uthuk army—howling demons stripped of all humanity as they rush into battle, desperate for the carnage promised by the theater of war. The Berserkers' erratic speed and violent nature is reflected in their action dial. In addition to three blue march actions falling between initiatives three and six, the Berserkers have a white march one modifier that can be paired with any action, keeping them mobile amidst the chaos of battle. The tribesmen of the steppes have no loyalty to a realm or to one another. They will readily sacrifice one of their own to increase their frenzy and enact their unit card ability. When participating in a melee, the Berserkers may choose to suffer a wound to gain Lethal 1 for the duration of the melee. However, if the Berserkers' ranks become too decreased, they will be unable to spread choas throughout the realm. Therefore, they may only use this abily twice per melee. Any who look into the glowing eyes of the Flesh Rippers know that death is soon to follow. Once one of these hell hounds has caught the scent of blood beating in the heart of its target, it will not give up the hunt until it has claimed the life of the damned. They answer only to their summoners, and at times even this is not enough to keep them from ripping their Uthuk handlers to shreds. When participating in a melee, these demonic cavalry units roll one red die and two blue dice—often equipping them with surges to unleash a new level of blood-fueled madness. The Flesh Rippers special ability states that they can spend multiple surges, dealing one damage to an engaged enemy unit for each surge spent. A bloodthirsty commander can even use the red action modifier on the Flesh Ripper’s command tool, which grants both a morale and a surge icon, to guarantee that their dark cavalry will deal at least one damage. Apart from preparing them for battle, the Flesh Rippers’ command tool emphasizes the demons’ supernatural speed. It is heavy with actions and modifiers focused on marches, shifts, and reforms. 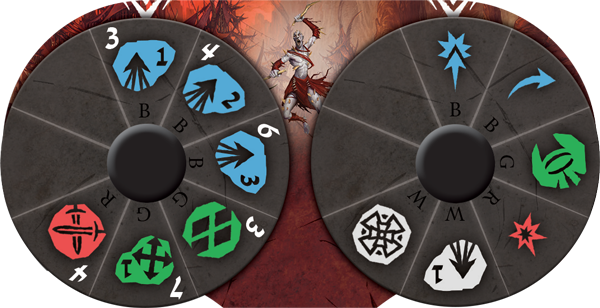 At initiative five, the Flesh Rippers may tap into their link to the Ynfernael to perform a march action equal to the number of unstable energy runes in play. If the forces of darkness grant their favor, this may allow your Flesh Rippers to move at a speed of four, the highest in the game. Even if the runes cast on the battlefield fall against the Flesh Rippers, they possess a blue march two modifier that can be paired with any of other march actions. Simply put, for sheer speed the Flesh Rippers are unmatched by any creature found on the mortal plane. The most difficult demons for the Uthuk’s blood witches to control are the fearsome Spined Threshers. These fiendish crabs are known to destroy entire martial units or tear down fortified towers single-handed, acting separately from their Uthuk allies, but still inflicting massive amounts of damage. Similar to the Berserkers, the Spined Threshers feature a white march one modifier, granting them greater mobility than many other siege units in the game. Their demonic presence also strikes fear into the heart of any mortal they face in battle. When participating in a melee, the Spined Threshers may pair their attack with a red modifier that not only provides a bonus hit, but a morale icon as well. A skilled tactician commanding these scuttling horrors can make even seemingly simple upgrades deadly. The Uthuk Y’llan Army Expansion includes the Bull Pennon upgrade, which can be used with any army faction and equips the paired unit with the Impact 1 keyword. 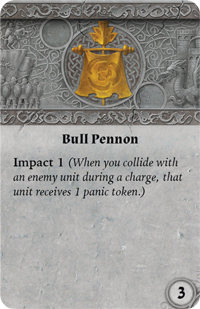 When a unit charging under the Bull Pennon collides with an enemy unit, that unit receives one panic token. This is particularly deadly when used alongside the Spined Threshers who feed off the fear of their enemies. During a melee, if the defender has a panic token, the player commanding the Spined Threshers may reroll a die. 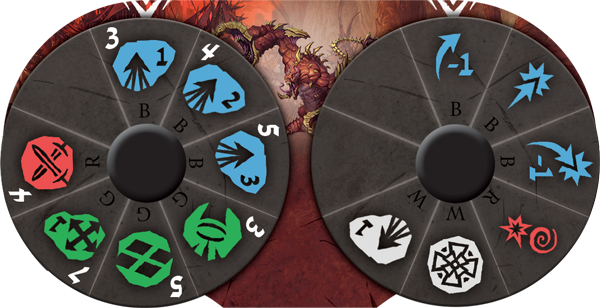 Considering that these demons roll two heavy hitting red dice when attacking, this bonus roll can practically ensure that the Uthuk’s siege unit will wreak havoc on all who stand against them. Call forth the powers of darkness. Bend the demons of the Ynfernael to your will and destroy all who would dare defy you! 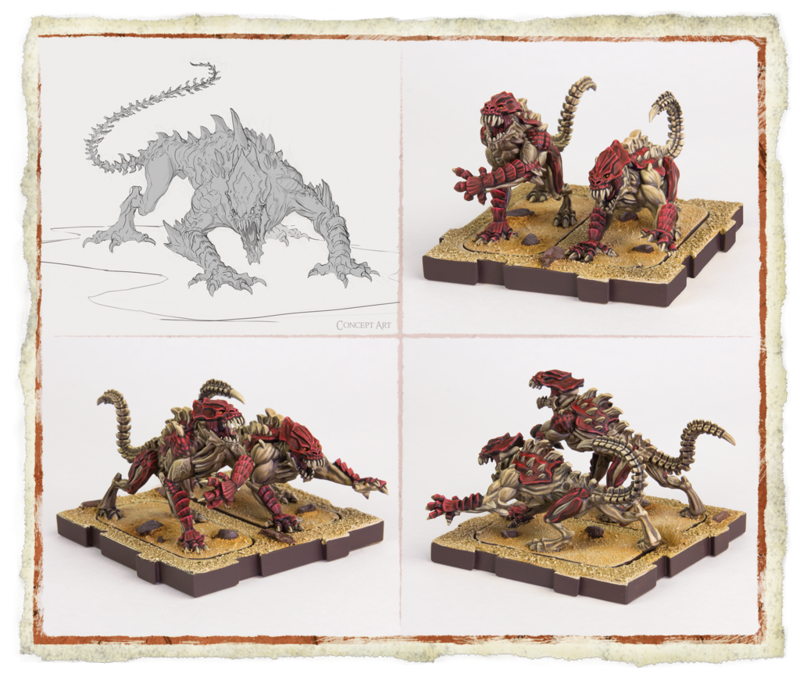 Pre-order the Uthuk Y’llan Army Expansion (RWM22) at your local retailer or on the Fantasy Flight Games website here!